If @d33jayslim isn’t from the West Coast, he must really just love its hip-hop. Among his strongest works are portrait heads of LA rap stars like Snoop Dogg, Tupac, Nipsey Hussle, and Black Hippy. 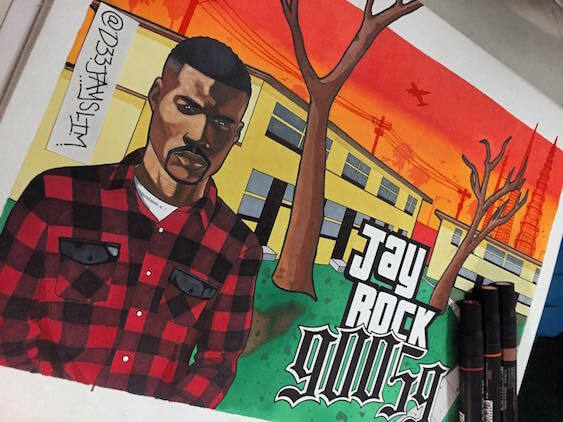 Continuing the thread of LA culture, he also perfectly recreates the typography from Grand Theft Auto: San Andreas for Jay Rock’s 90059 release. Makes sense, being that Rock was featured on the GTA V Radio Los Santos playlist.